DETAILS: This recently renovated multi-family residence with accommodations for five draws its inspiration from the sugar white sands and cerulean waters visible from its third-floor vantage point. Creamy walls, sea breezes and gulf views provide a restful backdrop for neutral furnishings dotted with aquamarine accents and artwork. The light-filled main area encompasses living and dining rooms and is comfortably furnished with a pair of new sofas and a flat screen TV equipped with DVD. There’s seating for six at the nickel-finish dining table, with two additional seats at the breakfast bar. The kitchen has cool white cabinets, with stainless steel appliances, sea glass backsplash and plenty of cooking space on the granite countertops. The serene private master suite is furnished with a king bed and enjoys gulf-view balcony access. The master bathroom has an oversized walk in shower and double vanity area for make-up application. Overlooking the living area below is a loft area furnished with customized built in bedding and a flat screen television. A second, newly renovated, bath on the main level contains a tub with a shower and single vanity. With only a short walk to the Gulf of Mexico, WaterColor Beach Club, restaurants and shopping, this condo offers a fantastic place to enjoy everything WaterColor has to offer! We had a great time in WaterColor! The gulf water is gorgeous! Clean beaches, friendly people and great food! Our condo was beautifully decorated and accommodated our party of four just fine. The stairs up to the loft are a little sketchy and must be carefully maneuvered, very steep. Bike availability was really nice also. We are so glad that you enjoyed your stay with us in Watercolor! 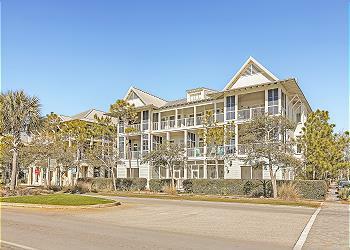 We agree that this condo is great for a fun beach getaway and our beaches are second to none! We adored the photo you shared with us and we can not wait to host you all again soon! We are so thrilled you enjoyed your vacation! We look forward to seeing you again soon! Great location. Clean and comfortable . Thank you for making our stay enjoyable. We did yoga, massages at Watercolor Inn and enjoyed all the amenities. Great walking and running trails. The shops and restaurants were so fun! The balcony has a fantastic view ! Wow! It sounds like you had a lovely and relaxing vacation and we could not be more pleased! 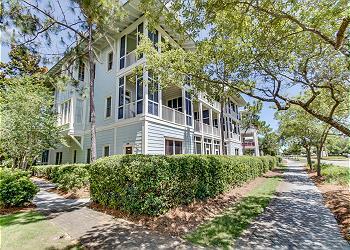 We agree that this condo has a fantastic view and Watercolor has so much to offer! We hope to host you again soon! Beautiful stay. Condo is very efficiently stocked, close to beach and LOVED the balcony. Neighbors our last night were smoking out there. Is that permitted? That was a tad bothersome. I maneuvered the loft stairs well, but can be potential danger for children and mature people who are not physically fit. We are so glad you enjoyed your stay at this wonderful Watercolor condo! We apologize for the other guests during your stay, smoking is not permitted within the building. We will make sure our team is made aware of your wonderful feedback. Thank you for coming and we hope to see you again soon! Exceptional location, decor, quality and comfort. Only issue was the steep steps to the loft, which was concerning for us all. Love the balcony and access to bikes. Our favorite activity was biking. We had a great stay and experience. Thank you, we would definitely come back and recommend the accommodation. We loved hearing how wonderful your vacation was. We agree biking in Watercolor is a wonderful way to spend your time here! We apologize for the stairs and we have shared this with our team. We hope to see you again soon! So glad that all was good on your trip! We can't wait to help you plan your next one! Great condo. Comfortable and convenient. Thank you for choosing 360 Blue. We are thrilled you enjoyed your stay and hope to have you back soon!